England are through to the World Cup quarter-finals and a game against Portugal they have every chance of winning - very much a case of job done. But the display against Ecuador was shocking and the real England haven't yet turned up here in Germany. I am still optimistic England will show their true colours out here, rather in the fashion of someone who arrives late at a party but still makes a massive impact. But there are so many concerns about how England have performed in this tournament so far. For the people who spent a lot of money travelling over to Stuttgart, I didn't think England gave them much hope. England's gifted players need the shackles taken off by an overhaul of the system, and it is well-chronicled I felt David Beckham should have been dropped against Ecuador. I would have had Steven Gerrard on the right of midfield, with Frank Lampard, Owen Hargreaves and Joe Cole as the other trio - and I would have paired Peter Crouch and Wayne Rooney in attack. I believe England's players have been stifled by a system they don't enjoy, and by a system that I honestly don't think they particularly want to play. The players are happy to play for England, but I think we have got to be far more positive. England will persist with this system against Portugal, but I think the experiment of having Michael Carrick as the holding player didn't work. 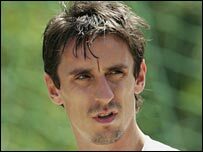 I think Hargreaves has to come back in there and England must keep their fingers crossed that Gary Neville is fit. England's World Cup hopes could actually rest on Neville coming back and stabilising things. He is such a key influence. And I will argue fiercely against those who say I am being negative about England by expressing these views. I am exactly the opposite, I just feel this team can produce so much more. Anyone who knows me, or who saw me play, knows how passionate and proud I am about England and how much I want them to win. But England have not given the fans, the press, or even themselves any consistency or a level of performance that indicates that they will be a force when it comes to the latter stages. Argentina and Brazil will look at England and know they have got players capable of performing, but at this moment they are not playing well enough to win it. England are playing winning football, a win-at-all-costs football - contrast that with the free-flowing football we loved watching in the Argentina-Mexico and Germany-Sweden matches. In Euro 2004, Greece triumphed despite not playing particularly great football. Maybe England can do that and we'd happily settle for it, but at this juncture everybody wants more and I think the players will want to play better too. They will go away happy they are in the last eight, but be a bit embarrassed by the way they got there. I think they will genuinely feel they are lucky to be there. Mexico, Czech Republic and Holland have gone home. There will be quality teams missing in the last eight because of the draw, but England's route through is a great one. I certainly think they can beat Portugal. I also believe they must produce better than they have done so far, but feel there is the talent in this team. Wayne Rooney and Steven Gerrard are world-class players. And I thought Ashley Cole was England's best player against Ecuador. But it was a thoroughly unconvincing afternoon. We had some dodgy moments at the back, but hopefully we are getting them out of the way before we play the really big guns. It is John Terry's first World Cup and Paul Robinson's as well, so you have to remember they are sampling this for the first time, and until you go through it you don't realise what a pressure situation this is. As I said, I am convinced England will come good at this World Cup, but it is not right at the moment. Take the shackles off England, and I still believe they will be a real force in the closing stages of this tournament - but they must improve.